Gold as a symbol of the sun: logical isn’t it? In the Bronze Age, people persistently showed their reverence for the Cosmos, and for the sun in particular, by making objects that replicated the sun, moon and other heavenly bodies. This may have been magic. In northern Europe especially, the sun is a rare commodity (I write during a cold, wet and windy June). Perhaps by making images, ancient solar worshippers were wooing the sun, enticing it so that it would shine and warm up the land. What better way to acknowledge and encourage the sun than to produce glittering golden images of the solar disc? Some of the earliest ‘sun-discs’ belong to the Beaker period, at the beginning of the Bronze Age (around 2500 BC). Many come from Ireland but one relatively recent discovery is from Wales. It was found in a Beaker grave at Banc Tynddol, Cwmystwyth, the site of an important Bronze Age copper mine in north-west Ceredigion. Perhaps the dead person was an early mineral prospector, and similarity between this disc and others from Ireland may mean he (or she) had connections across the Irish Sea. 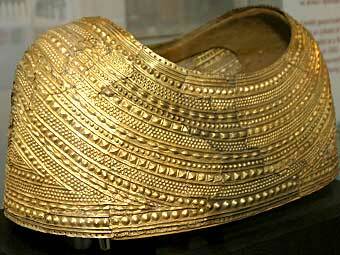 Why were certain people in the Beaker period buried with ornamental gold discs? 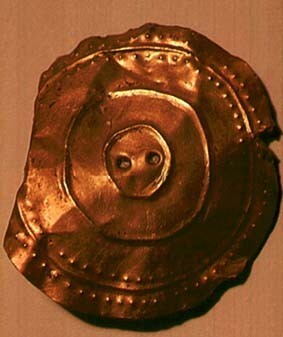 Was it simply a mark of status or was a deeper, solar symbolism associated with these early Bronze Age decorative gold circles, a symbolism that found a louder voice later in the period? 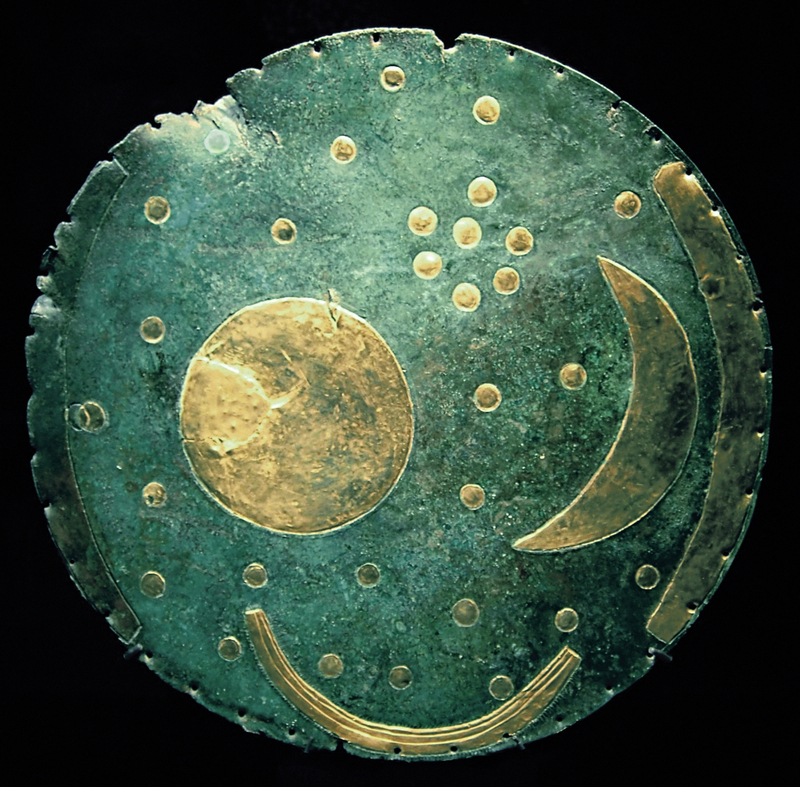 In about 1600 BC, a community living at Nebra in Germany buried a large copper-alloy disc, about the size of a large dinner-plate, presumably interring it as a ritual act. I have a replica of this remarkable object lying on my desk beside me. It clearly displays celestial bodies, for inlaid in gold upon a specially darkened bronze surface are a circle and a crescent, perhaps representative of the moon in its different phases or of the sun and the moon. Dotted around the surface of the disc are small circles, presumably stars, but one group of them is particularly striking: a pattern of seven dots near one point of the crescent-moon appears to represent the Pleiades, a cluster of stars whose rising and setting were used by ancient farmers to calculate when harvesting and sowing crops should begin (the ancient Greek Hesiod mentions this in his Works and Days written in the 8th century BC). But there is more to the Nebra disc. Two inlaid gold arcs along opposite edges of the disc reflect horizons, used to plot the position of sunrise and sunset at the solstices. Some clue as to the beliefs of the people who made and used the disc may be found in one other golf-inlaid crescent shape, that of a ‘solar boat’, a well-known religious symbol in the northern European Bronze Age (and, of course, a familiar trope in Egyptian cosmology, where the boat took the sun into the netherworld during the night, to be reborn in the sky, at dawn each day). We can only imagine how such an object might have been used and by whom: Bronze Age priests studying the disc at different times of the day and the year, controlling the pastoral calendar and thereby accruing immense and arcane power. There is evidence that the Nebra disc was subjected to deliberate damage before it was interred. Was this part of a closure ritual? Was the object too charged with magical meaning to allow it to go into the Otherworld unscathed, was the danger that someone else might dig it up and use or misuse it? It wasn’t only at Nebra that people were using large cosmic discs in ritual activity. About 200 years later, a bronze-smith constructed a miniature four-wheeled wagon (about 60cm long) drawn by a slender, beautifully-crafted horse, depicted wearing the replica of a chamfrein, a piece of decorative head-harness (imitating a real one of leather and bronze), with solar ray-ornament around the eyes. 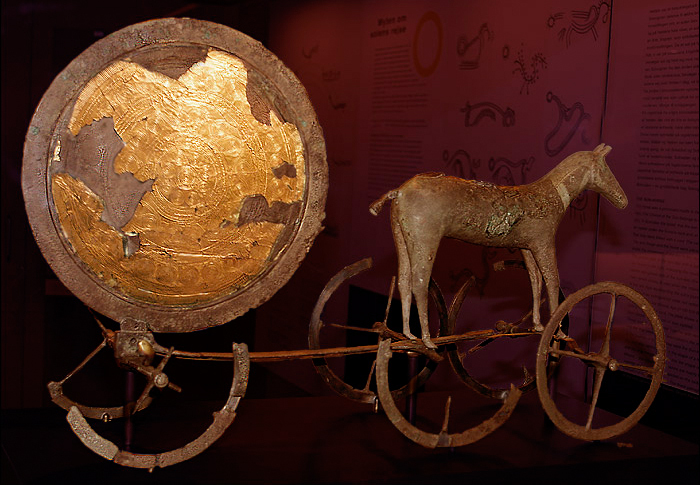 Vertically mounted on the vehicle was a large double disc, one side plain, the other gilded, the gold sheet patterned with rays, circles and spirals to represent the noonday sun at its full strength. The solar wagon comes from Trundholm in Denmark. Like the Nebra disc, it was deliberately buried, after being purposely damaged. Again, like Nebra – but even more so – there is an evocation of movement. The bright and dark side of the disc seems to reflect day and night, and the carriage of the sun across the sky towards its zenith and decline into darkness. The Trundholm cart may be a miniature replica of a full-size wagon drawn by a real horse and carrying an immense disc, perhaps of wickerwork and set alight for a festival. Whether this is true or not, the Trundholm horse and carriage provides an insight into the kind of sun-wooing rituals that may have taken place in northern Europe, perhaps during the darkest days of winter when the sun struggled to climb above the horizon. The link between the horse and the sun became especially close in later prehistoric Europe. It was a recurrent image on the reverse of Iron Age gold and silver coins. What about the participants in Bronze Age celestial rituals such as those suggested as taking place at Nebra and Trundholm? There is some intriguing ‘evidence’, in the form of tall ‘sun’hats’ made from hammered sheets of gold, found near Etzelsdorf, at Schifferstadt (both in Germany) and at Avanton in southern France. The Etzelsdorf hat was 95cm high, and covered in horizontal bands of repoussé decoration, mostly in the form of solar wheels and concentric circles. Was this the kind of regalia donned by priests (who might also have donned gold mantles, like the spectacular gold cape from Mold in north Wales) to celebrate and venerate the sun during seasonal festivals, perhaps accompanied by a rolling cart bearing a flaming wheel, or chanting over a sky-map?